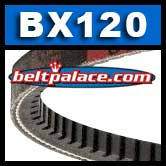 B120 BANDO POWER ACE Classical V Belt. Industrial Grade. 21/32" W x 123 inches O.C.